Yesterday, Nintendo aired the final Super Smash Bros. Ultimate direct. With over 70 characters and a ton of assist trophies, a ton of little references, nods, and things you might otherwise have not noticed pass by really quickly during the 40-minute Direct. You can take a look at a few of them right here! Back in 2004, Evo was a much smaller event than it is now. The smaller hall pales in comparison to the tournament that now takes over a giant arena at Mandalay Bay, but one of biggest moments in fighting game history happened long before the scene blew up. In a match between Justin Wong and Daigo Umehara in Street Fighter III: Third Strike, Wong’s Chun Li had Umehara’s Ken on the ropes in a semifinal match. Wong used Chun Li’s Super Art, a series of kicks, against Umehara, who managed to perfectly parry all 15 hits, and finish him off with his own Super Art. 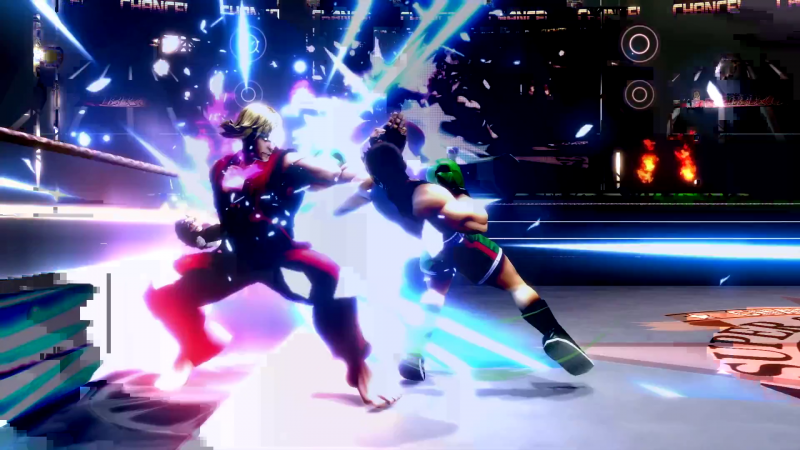 The moment, while not as extensive here, is reproduced at the end of Ken’s trailer in the Direct. During Incineroar’s move explanation, Smash Bros. director Masahiro Sakurai says that Darkest Lariat is Incineroar’s signature move, which spins him around with his arms out. “Perhaps it’s something of a red cyclone,” Sakurai states, referencing the nickname for Street Fighter II character Zangief. 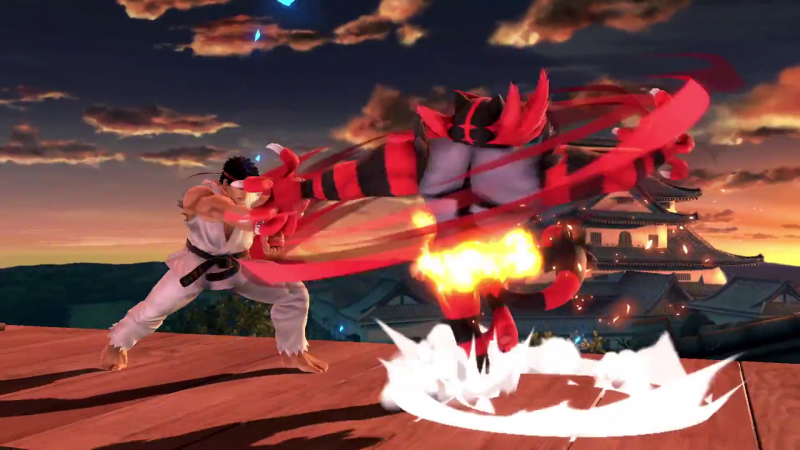 The Russian wrestler has a similar move which, resemblant to Incineroar’s trailer, allows him to dodge projectiles. Incineroar’s version blocks them, however, rather than letting them pass through. Sakurai, before he directed the Super Smash Bros. series, was a competitive Street Fighter II player. While Wily has gotten on his knees and begged Mega Man to let him go quite often, this assist trophy references one of the darker ones. The trophy itself is of Wily Capsule 7, one of the most frustrating final Wily fights in the series, as he produces energy balls that home in on poor Mega Man. After being defeated, Wily falls to the ground. In both the Japanese and western versions, Mega Man threatens to end Wily for good and Wily begs for his life. It diverges a little here depending on the version you’re playing. In the Japanese release, Mega Man simply stays silent, hesitates, and Wily gets away. In the American version, Mega Man says he is more than just a robot, and punctuates his point by yelling “Die, Wily!” who then gets away, anyway. 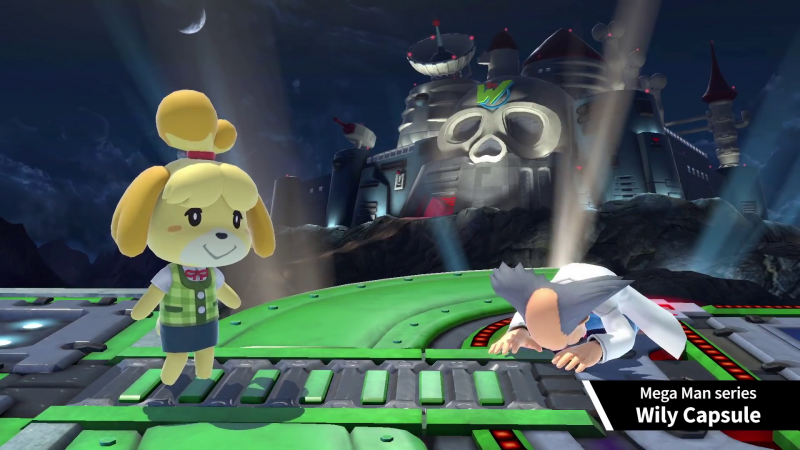 In the Smash Bros. reference, Isabelle breaks Wily’s capsule and then lets him go, because Isabelle threatening to kill someone would be weird. Guile joins as an assist trophy, coming in with his giant vertical hair and charge moves. As a trophy, Guile sits crouched, intercepting anyone that comes his way with a Flash Kick in the face. If you throw projectiles at him, he’ll block them, because he’s currently holding Down and Back while he charges the move. It’s the most common way for people to play Guile, as charge characters (characters that hold directions rather than execute motions) are primarily defensive. Guile is sitting in the corner and waiting for the opponent to jump in. Also fun note: this is the second time a character in the game and an assist trophy have been related. Guile is Ken’s brother-in-law, with Ken married to Guile’s wife’s sister, Eliza. The other example is Waluigi to Wario, probably…who really knows with those two. The very blocky Akira makes his third fighting game crossover appearance in Smash, with Dead or Alive and Fighters Megamix predating this one. 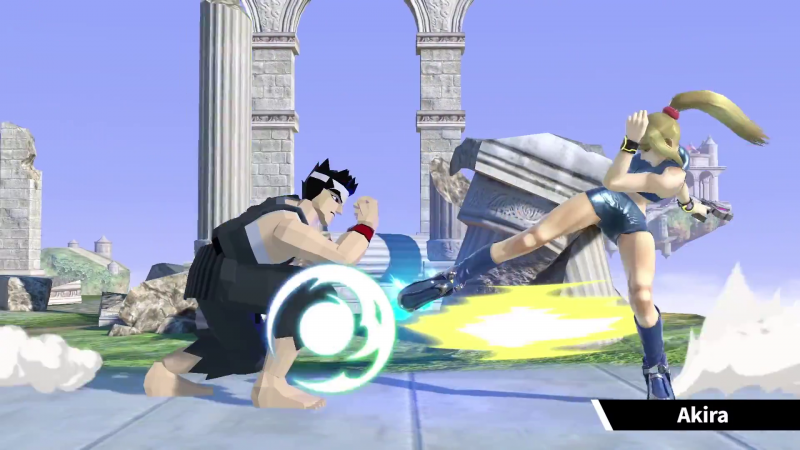 In his short footage, Akira squares off against Zero Suit Samus in her glossy two-piece outfit, and then against Wolf. Samus is referencing Sarah Bryant, another pony-tailed blonde character who wears a glossy blue outfit from Virtua Fighter. Wolf is a stand-in for, well, Wolf, the red-haired fighter that frequently ends up as Akira’s rival. Samus even tries a low kick on Akira before he blocks and pushes her away, a reference to how the meta surrounding Virtua Fighter heavily emphasized how quick and powerful low attacks are, which meant that everyone eventually knew to expect them. 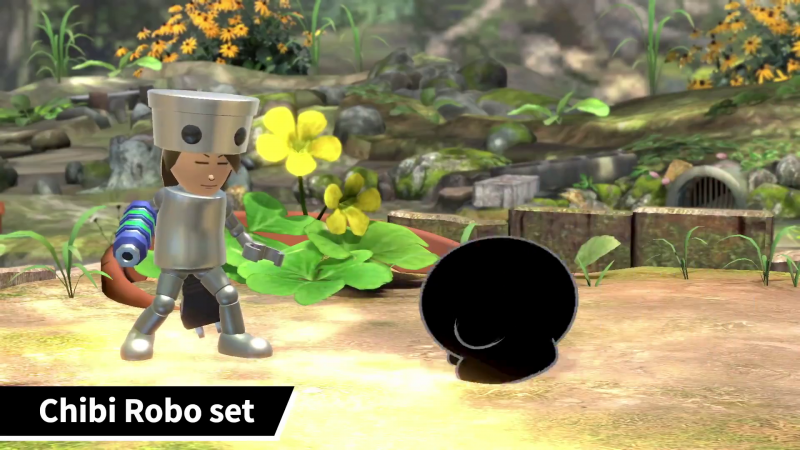 In the Mii Fighter customization reel, it briefly shows a Mii wearing a Chibi Robo outfit, who then knocks away several negative-colored Kirbys. These little guys are referencing the Wal-Mart-exclusive DS title, Chibi Robo Park Patrol, which almost no one played. Kirby is supposed to be a Smoggling, a little black puff of pollution created by a not-very-friendly enemy. 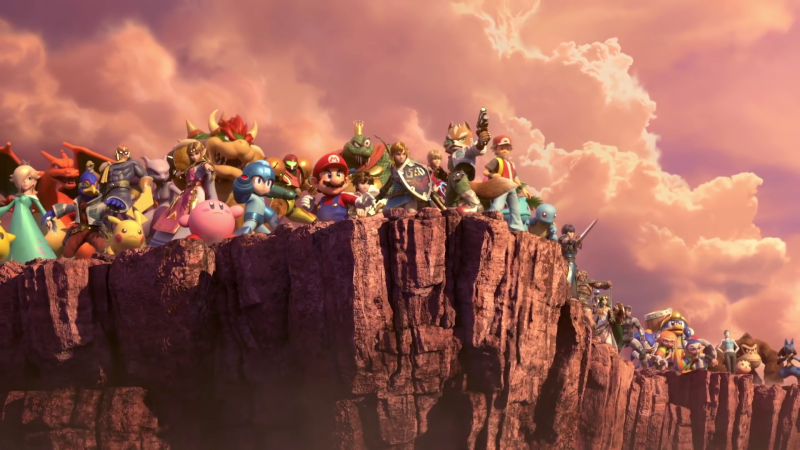 In the cutscene introducing World of Light, Smash Bros. Ultimate’s single player mode, a few third party characters can be seen, but not everyone. Capcom consented to letting Mega Man face off against the ethereal eldritch horror seen in the distance, but neither Ryu or Ken were willing to take part. Street Fighter is owned by Capcom U.S.A., which means they might not have been as interested in seeing Ryu explode into light. Both Simon and Snake are seen at the beginning and both presumably get captured by the light, you can only really infer it from Snake’s box being hit. Richter, meanwhile, is nowhere to be seen. Cloud is also completely missing, though perhaps he has simply had enough of angel-winged enemies bathed in golden light causing the apocalypse. Both Sonic and Bayonetta are directly shown getting hit, so Sega was all on board this train. Much like he can within Xenoblade Chronicles, Shulk saw that everyone was about to lose. Also much like Xenoblade, there isn’t always really anything he can do about it. The vision comes too late, and his attempts to warn the others seemingly don’t work. It is theorized that Shulk used the Monado’s power to help Kirby get away by making him faster, which is an interesting thing to do with your last available second. 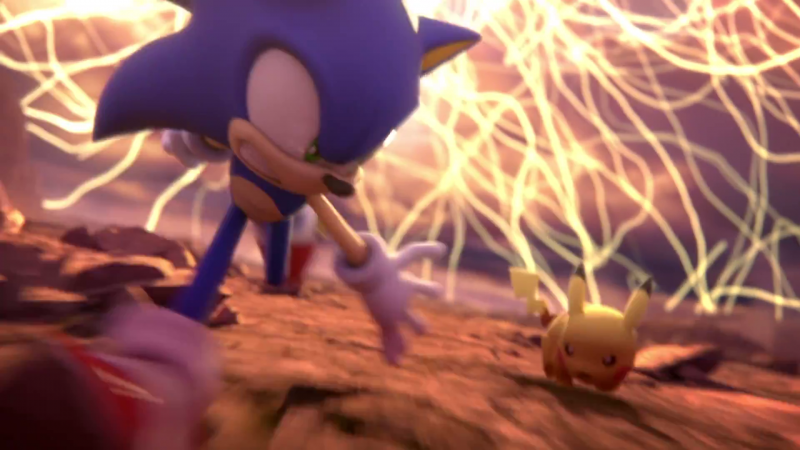 As Sonic is running away, he slows down slightly to grab on to Pokemon’s mascot character, Pikachu. The electric mouse is lagging behind and reaches out for Sonic, who also reaches out to the Pokemon, but Pikachu gets taken. Sonic is shocked for a second, slowing down again, before also being hit. It makes sense, because of course Sonic the Hedgehog would prioritize saving small woodland animals over living to fight another day. That’s pretty much his raison d’etre. In the Bayonetta games, dodges are extremely useful and powerful. You can basically avoid ever being hit in the game if you master dodge. To increase the window a little bit, the games have a purchasable skill called Bat Within, which lets you miss your dodge window slightly and negate the damage of getting hit by transforming into a swarm of bats. To balance this out, if you spam dodge without a little cooldown, she can’t dodge again for about one second. 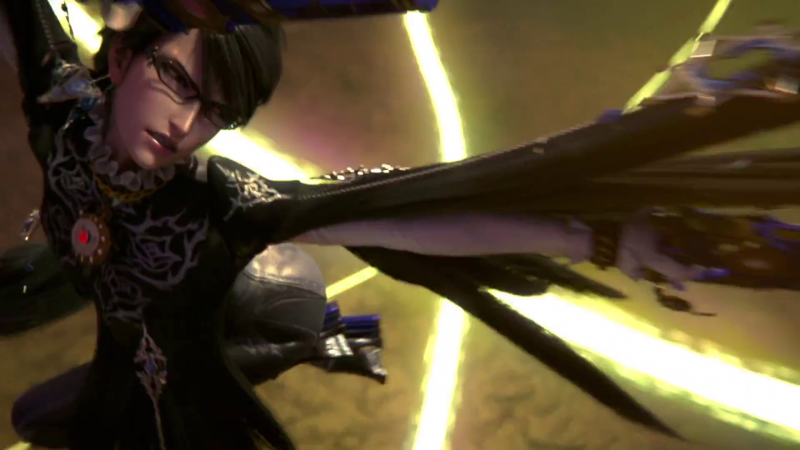 Here, Bayonetta backflips out of the way, gets grazed and uses Bat Within, then air-dodges coming out of Bat Within. She’s run out of dodges and, judging by the resigned look on her face, knows she’s through when she gets hit by the light. When Palutena, Pit, and Dark Pit attempt to escape from the light, the goddess stops and tries to use her all-powerful reflect to keep the light at bay. Since she guides their flight paths, she keeps them moving past her against their will, so they keep flying and get some distance from the attack. 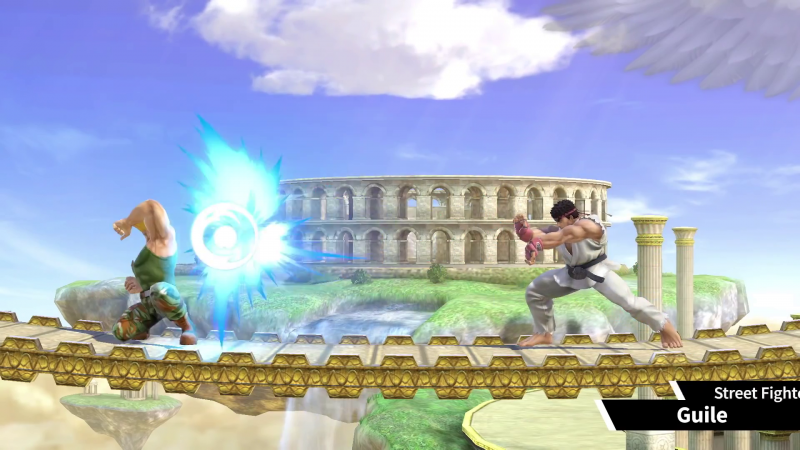 Palutena is unsuccessful and gets absorbed. 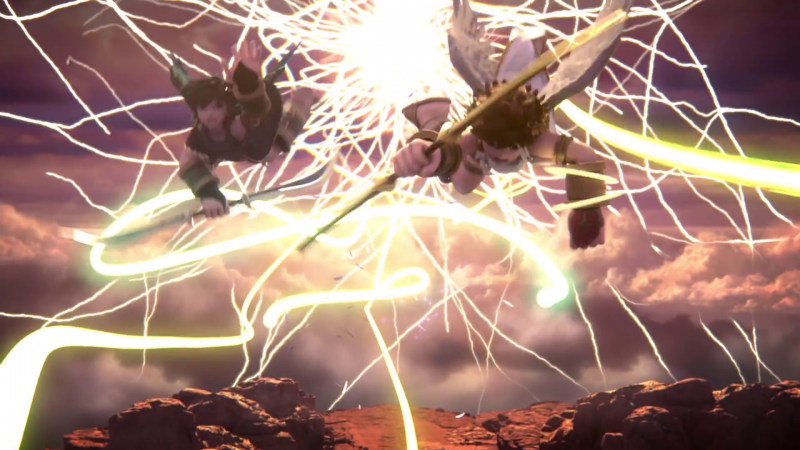 While Pit and Dark Pit presumably could have still gotten away, Palutena getting disappeared robs Pit of his flying powers and he stumbles in the air and gets taken. Dark Pit, who was born as a clone of Pit from the Mirror of Truth, does not depend on Palutena’s powers to fly, but his bond as Pit progeny means he loses those powers when Pit does, anyway. 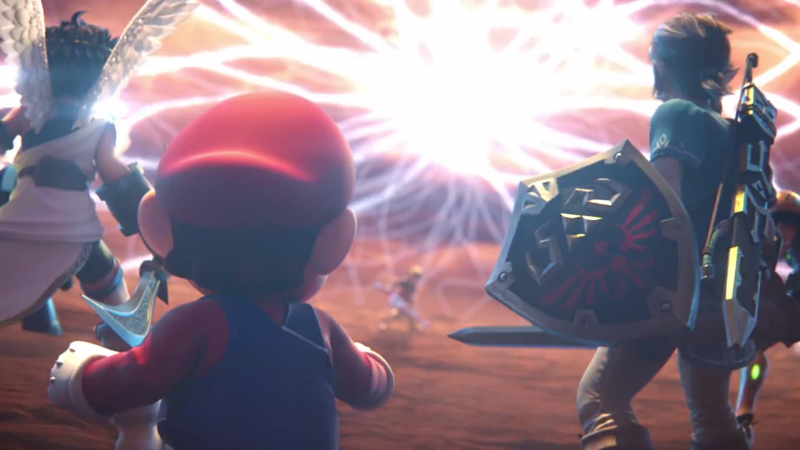 Way back earlier this year, when Super Smash Bros. for Switch was revealed and no one was quite sure if it was a port or a new game, there was a somewhat strange trailer. The Inklings were playing around when the world’s lights shut off and the roster of Smash Bros., covered in an oppressive darkness, stood underneath the logo. The silhouetted images stared at the Inklings in an oddly ghastly way, but their eyes were never seen. 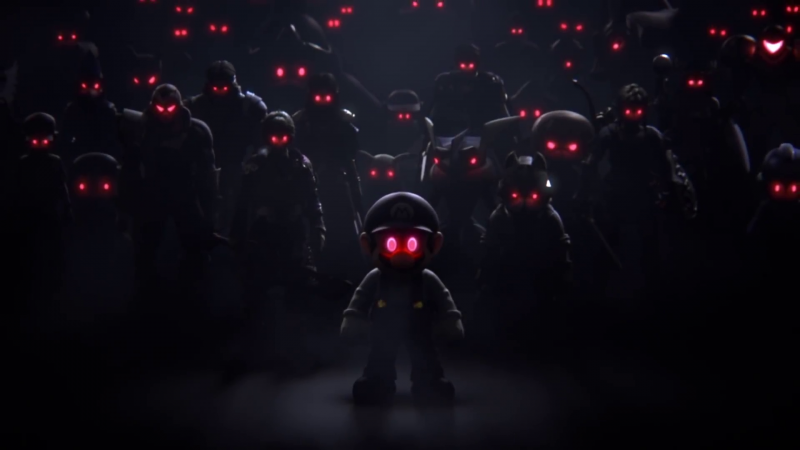 Now we can guess that the trailer was the first hint at the new story mode, which presents the clones of Super Smash Bros. fighters with red eyes and a preoccupation with fighting. The last shot of World of Light shows an incredibly similar image, but reversing the silhouette so we can make out more details. Regardless of what you think of the series, it is undeniable that they are filled to the brim with details most people will never notice, but fans will appreciate. You can find out what else might not notice at first blush when the game releases on Nintendo Switch on December 7.